It’s February 26, about 73.33% through winter. Not that I’m counting. It’s partly the snow, the cold, the hurricane-force winds that blow out of every gap in the ridges of Colorado’s Front Range that have limited my days climbing out of doors to 4 since early January. It’s also my ever decreasing tolerance for adverse conditions while climbing. I rationalize that I’m saving up my suffer tickets for when it really counts, like coming down a mountain at 3am, but the reality is more that I’m just getting old and suffering doesn’t thrill me like it used to. 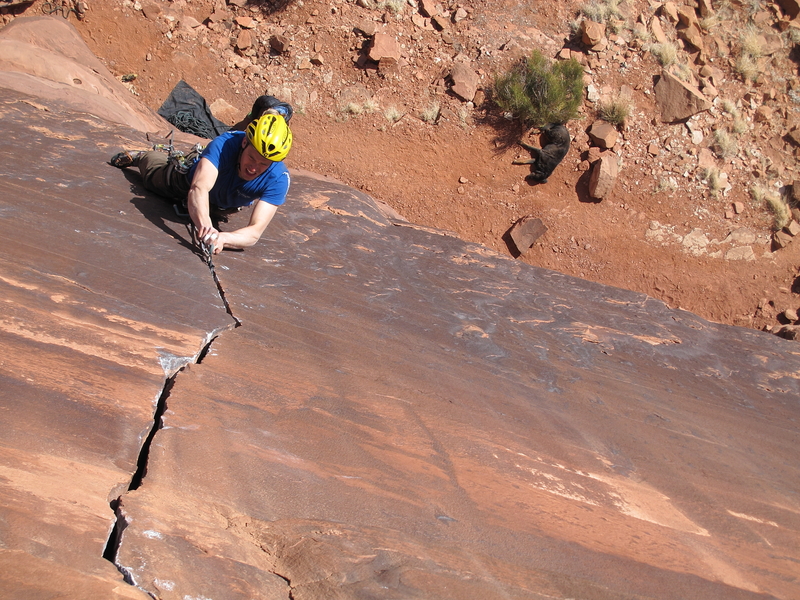 Like many climbers, I wile away the “dark age” (i.e. winter) by training. My goal in the last few weeks has been strength training, so actual climbing has taken a back seat to hangboarding and lifting weights. Recently, I did a hangboard workout when my parents were visiting. They are already hyper-aware of my obsessive behaviors about climbing, and their reaction to seeing me strap 25 lbs. around my waist and repeatedly hang from half-pad edges fixed to the main brace of my house revealed the depth of the absurdity that training for climbing really is. Climbing, to the vast majority of the human population, is already ridiculous. Training, especially on hangboards, is everything hard and stupid about climbing without any of the thrill or fun. So why do we do it? Why do we punish ourselves, endure hours of mundane repetition, and risk injury just to make our fingers just a bit stronger? The short answer is that it’s just that: a really effective way of making our fingers – and the rest of our bodies – stronger. 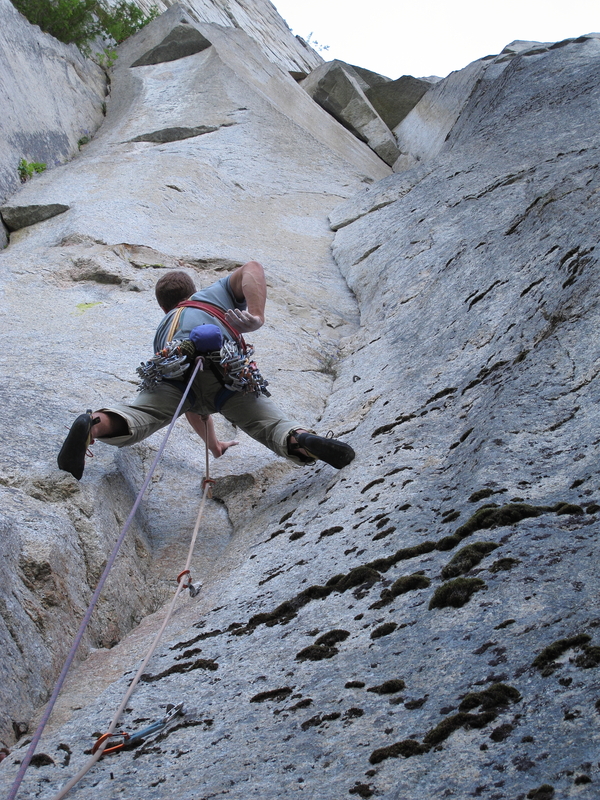 And, while strength isn’t the only factor in climbing well, it certainly is a big part of becoming a better climber. But the drive to be a better climber is broadly even more questionable. In the last few weeks, a thread emerged on Mountain Project entitled “Why climb harder?” Punctuating the typical profane witticism that only Internet forums can conjure were a variety of responses and reflections about the value of climbing harder. Several zeroed in on why one would endure discomfort (i.e. training, suffering, risk to life and limb) for the sake of performing at a higher level an activity that under the most gratuitous constructions only provides a highly subjective satisfaction. In other words, if I’m the only one who gets anything out of my climbing better, why should I bother doing anything other than maximize my fun? So then, on a philosophical level, why hangboard (or, simply substitute any other activity that aims to improve climbing – or any other performance for that matter – that is likewise not fun and/or comfortable, which, for lack of a better term, I’ll refer to as “training” from here on out)? My friend Steve, climbing harder than most folks. An easy answer is to say that if I hangboard and you don’t (or if I just hangboard more than you) I am more likely to climb better than you. Performing at a higher level leads me to believe I am in some way better than you, thus stimulating an anachronistic conclusion that I’m more likely to survive an attack/get laid and pass on my genes to future generations. I think we can all agree that in civil society climbing supports neither and probably works in the other direction. Thus, in our more rationale moments, we can (hopefully) see that climbing cannot be strictly ego driven. There are a lot of other reasons to train, to be uncomfortable, to get better. Most of these are mentioned in the thread. Just go read it, if you’re, say, stuck in an airport terminal as I currently am. To summarize, folks argue for gymnastic growth, surpassing of limits, developing a warrior mentality, greater access to more classics, and the safety of climbing on steeper routes. Which at some point may have been true. My lady loves tips laybacks! Trump avoided, the first reason I think we ought to be willing to be uncomfortable to climb more difficult routes is for the sake of novelty. Let’s say you start running three miles, three times a week. At first, if you’re never run before, you’ll be tired and bit sore and probably lose some weight. After a few weeks, those runs will start feeling easy. Your legs will be a bit stronger, and you’ll compensate for the added activity by eating a hair more. Eventually, your body will stabilize and return right back where you started. Our psyches work the same way. What we perceive as difficult at first will at some point become normal. Invariably, without new stimulus, we find routine and comfort. We stagnate, gain weight, become complacent. Novelty is, by definition, the only way to short circuit the homeostatic matrix of the mundane. By actively seeking novelty in our climbing, our bodies and minds learn to adapt, to continually grow. We force our muscle fibers, neurons, and paradigms to be as dynamic as the universe is in which we exist. The pursuit of an aesthetic is another reason to be uncomfortable. I think if each of us ponders it enough, we all have some kind of ideal rock climb, an imaginary line that embodies the qualities we love about climbing. Mine is a long route, requiring a full day at least, in the mountains, that is mostly steep, clean, and hard crack climbing but with a few face sections (and, since we’re working in ideals, has comfortable ledges, bomber anchors – bolts are welcome – and a casual walk off). Part of my aesthetic is a route that is challenging enough that I might fall off it, which is clearly a bias toward difficulty. Nevertheless, to climb another route that more closely resembles an ideal, any climber will have to be open to a novel experience, one that has a higher likelihood of discomfort and challenge. Therefore, at some point, we’ll all have to do something that isn’t fun, whether it’s for strength for smaller holds or endurance for greater fatigue or risk, to be able to climb a route that’s closer to perfection. 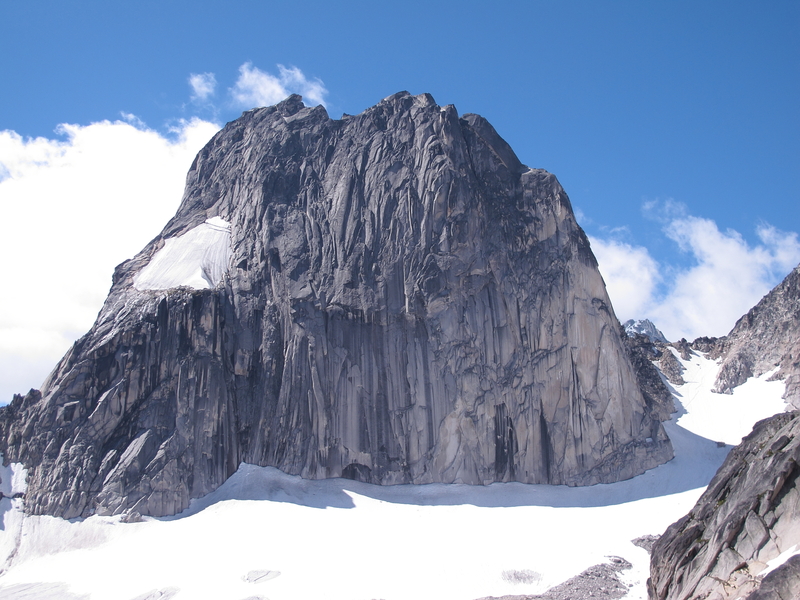 The East Face of Snowpatch Spire, holding several lines that approach my ideal. There is one last reason to train to climb better. I’ve been writing this piece over a few days, and in that time I’ve done the last hangboard workout in this phase of my training. Not only am I obsessive enough to do these silly things, but I’m also obsessive enough to record each workout. As I look back through my record, it’s clear that my fingers have in fact gotten stronger. I’ve been focused on working toward this goal – finger strength, and now my mind wanders to the next step, which will be a road trip around the desert of Utah and Nevada in March, and I can’t help but feel excited at the possibilities. Working on specific things to improve our performance promises new opportunity. Climbing, regardless of how difficult, will feel different now. This is the last and best reason to “train”: the promise. Whether we actually send isn’t the point, but just feeling the excitement of the opportunity, the newest in our once familiar minds and bodies, is worth effort and discomfort. That’s my pitch for training. It offers novelty and the pursuit of some kind of ideal, but really, working to get better promises a new opportunity. So figure out what you want to work on: finger strength, fear of falling, all-day endurance, footwork on slabs, whatever, just work on it. Get better at it, then dream about what’s next. The dark age will end; the snow will melt, and the wind will cease (at least for a few minutes, hopefully). When it does, we’ll all be just a bit more motivated, which is pretty fun. I’m convinced! But I’m still not so sure about the fingerboard. Damn I look good climbing harder than most! Looking forward to climbing with you next weekend.